The 64 Yogini temple is situated in a serene location near the Kuakhai river. This is a 9th century circular temple without a roof. 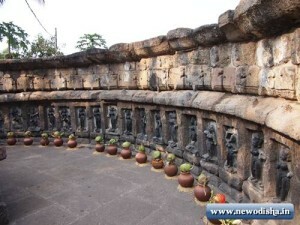 There are 64 yoginis carved out in the circular wall, each in a different position and on different mounts. The place is well maintained and gives a feel of peace and serenity. This is one of the most complete Chausath (64) Yogini temples in India with only one yogini missing from the temple. This is a very small temple compared to others in India. It is situated off a less travelled road from Bhubhaneswar to Konark, so one cannot get any public transport to get there as no one travels there regularly and hence one is forced to hire a private taxi or car to get there. Not many road signs to direct you to the temple so it is better to ask frequently lest you miss out on the right way to get there. There is an Archaeological Society of India’s caretaker who is a great guide as well and he explains the names of the different yoginis along with their vahanas (symbolic vehicles) to make it easy to identify them. There is a small book about this temple available for sale at Rs.150. Well worth a visit to this temple if you have an interest in art, history and architecture. 1. Chhaya, 2. Maya, 3. Narayani, 4. Brahmayani, 5. Bhairavi, 6. Maheswari,7. Rudrayani, 8. Baseli,9. Tripura,10. Ugratara, 11. Charchika, 12. Tarini,13. Ambika Kumari, 14. Bhagabati, 15. Nila,16. Kamala, 17. Santi, 18. Kanti, 19. Ghatabari,20. Chamunda, 21. Chandrakanti, 22. Madhavi,23. Kachikeswari, 24. Anala, 25. Rupa,26. Barahi , 27. Nagari , 28. Khechari ,29. Bhuchari, 30. Betali, 31. Kalinjari,32. Sankha, 33. Rudrakali, 34. Kalavati, 35. Kankali, 36. Bukuchai, 37. Bali, 38. Dohini,39. Dwarini, 40. Sohini, 41. Sankata Tarini, 42. Kotalai, 43. Anuchhaya, 44. Kechamukhi Samuha, 45. Ullaka, 46. Samasila, 47. Mudha, 48 Dakhinai, 49. Gopali, 50. Mohini,51. Kamasena, 52. Kapali, 53. Uttarayani,54. Trailokya Byapini, 55. Trilochana,56. Nimai , 57. Dakeswari , 58. Kamala ,59. Ramayani, 60. Anadi Shakti,61. Balakshatrayani, 62. Brahmani, 63. Dharani 64. Matangi. Give Responses for "64 Yogini Temple in Odisha"